Digital signage is viewed as the “next big thing” for advertisers, marketers and promoters in a wide range of market segments, including retail, hospitality, entertainment, restaurants and convenience stores. Consumers are captivated by animated images on digital menu boards, fountain drink dispensers, merchandisers, building surfaces and billboards. Innovative brand owners and businesses use digital signage to highlight, inform, educate and engage consumers as they seek to enhance customer experiences in their venues. At the same time, point-of-sale software has grown from a “cigar box” into a sophisticated offering that uses the latest technologies to manage business operations more efficiently and cost effectively. By integrating the two, one can harness these robust technologies to leverage an engaging and powerful marketing and messaging channel. The prevalence of digital signage and the seemingly endless variety of POS systems gives people the impression that integrating the two is just a walk in the park. But without thorough preparation, education, the right equipment and experience, success may be out of reach. Integrating POS software and digital signage requires specialized education, training and experience in order to achieve a successful business deployment that drives demand and will meet business objectives, resulting in increased value for employees, shareholders and, most importantly, consumers. The digital signage industry has been experiencing incredible growth and is increasingly playing an important part in nearly all business-to-consumer settings and public venues around the world. With this phenomenal growth, it may seem that anyone can sell you a digital sign. But the components of understanding how to accomplish your objectives, choose the proper technology for your purpose, and determine where and how to integrate with other technologies have never been more important. For retail companies, digital signage can be an efficient and effective platform for increasing revenue and influencing consumer purchasing behavior. For example, in quick-serve restaurants, more than half of consumers make purchasing decisions after arriving at the venue. By going digital, the point-of-purchase—the moment and place where consumer buying decisions are made or transacted—can become a more rewarding interaction for both the business and the consumer. 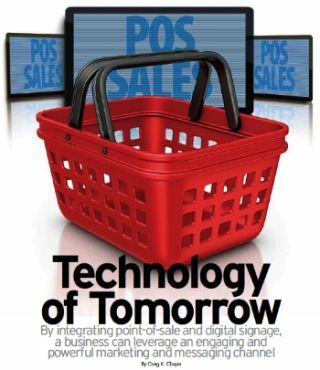 For example, aligning identified business needs—such as up-selling or add-on sales—with identified consumer needs—including faster and easier decision-making at the point-of-decision—through an integrated digital signage POS system can result in a greatly enhanced brand-to-consumer experience. Standardized, consistent brand representation and messaging (global, regional, local). Engaging viewer focus on featured products, services and information. Measurable ways to increase revenues and decrease operational cost. Increase efficiency and accuracy via single system data entry, reporting and support. Maximize the impact of your signage strategies at the point of purchase. Enable real-time synchronized updates (because as POS is updated, digital signage auto-updates with corresponding information), better managing constantly changing information sources, requirements and needs. Pull relevant POS system information for display to specific types of digital signage such as digital menu boards, kiosks, digital merchandisers, order confirmation screens and digital fountain displays. As you can see, all of these benefits impact the consumer, the business and its employees greatly. To this end, in an effort to improve product diversification and quality of service, a business can decide to implement new POS and digital menu board systems. Both of these systems are fully integrated to provide a single interface for price and content changes, allowing the business to focus on its core competency: ensuring employees put a greater focus on their customers. This marriage of technology offers tremendous flexibility with regard to ease of price and promotion changes. Businesses can easily implement targeted marketing and price initiatives within given markets. The convergence of POS with digital signage has allowed for promotion of freshly prepared items, items approaching hold times, promotional trends based upon sales figures along with specials that mitigate spoilage and increase the quality of the product. When it comes to running a successful, revenue-driving and engaging POS-based digital signage implementation, it’s vital to be as fully prepared and informed as possible. This means understanding the tools required, from hardware and software to content creation and scheduling. Be sure to seek out and leverage the experience, success and support of a market-proven digital signage and POS integration partner.